In November 2017, British Columbia finally banned corporate and union donations in politics. This was not an easy feat. Many politicians, donors and lobbyists worked very hard to make sure that ride did not come to an end. But everyday British Columbians won that battle against power and wealth. It was a historic win. British Columbians from all backgrounds banded together to hold politicians accountable. And with that victory, we made B.C.’s democracy stronger. But Big Money heavyweights did not take that loss well. And now, as the province takes another step towards a stronger democracy, they are fighting back to keep the power they still have. Proportional representation means a louder voice for regular people, and less influence from lobbyists and donors. And groups who have grown accustomed to power in government are getting worried their easy street is about to become a dead end. Luxury real estate developers, industries built on environmental destruction, big donors, old premiers — all desperate to maintain the status quo. The Urban Development Institute (UDI) is a lobby group that works on behalf of more than 750 real estate industry corporations. UDI works hard to shape local laws and regulations to the advantage of developers . 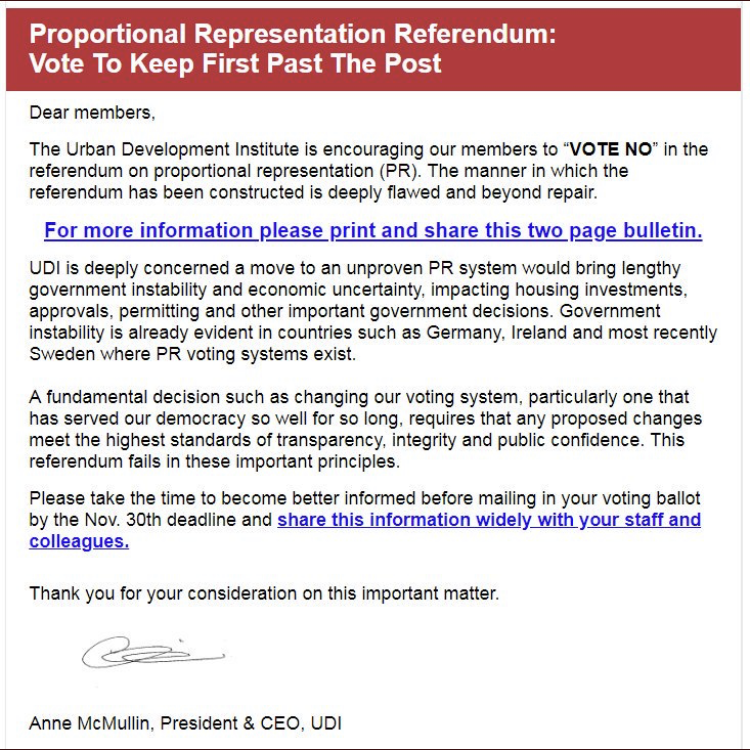 Last week, the UDI’s president, Anne McMullin, sent out an email to all members asking them to vote against Pro Rep. The real estate lobby is “deeply concerned” that Pro Rep could impact housing investments. In other words, the gravy train could be coming to a halt. Pro Rep would mean that governments would have to listen to all voters, not just their base, and take their constituents needs seriously, not just the wants and whims of their donors and lobbyist friends. It’s not just the housing market. 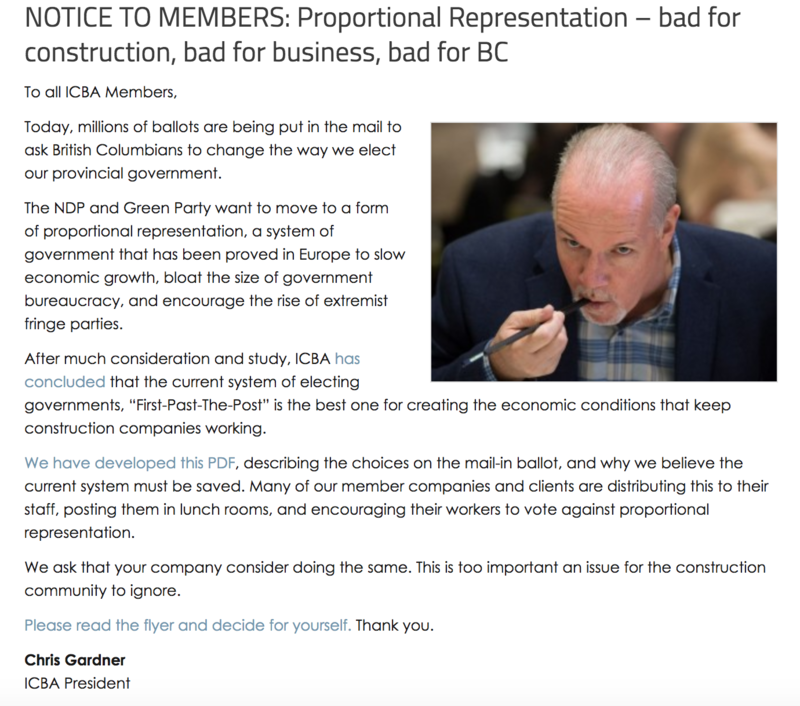 The Independent Contractors and Businesses Association is a lobby group that promotes any project that might employ its members — like the Site C dam, the Trans Mountain pipeline and tanker expansion project, the Massey megabridge or the Ajax mine. And the ICBA is used to getting its way. With many British Columbians concerned about building more fossil fuel megaprojects, it’s no wonder the ICBA is worried about voters having more power. Countries that use Pro Rep consistently enjoy higher environmental standards — and have shrinking carbon footprints. “ICBA has concluded that the current system […] is the best one for creating the economic conditions that keep construction companies working,” wrote president ICBA in a letter to members. Well yeah, governments that approve dangerous and disastrous projects with impunity would be good for business. They’ve gone a step further than just trying to influence their membership. This past summer, ICBA filed an injunction to stop the referendum. The courts denied the injunction, but the group is back in court this week to argue their appeal. Unfortunately we are still seeing the effects of the donor free-for-all era that plagued this province for decades. We know that there is still much work to be done to level the playing field. And with electoral reform on the horizon, those same donors might be getting a bit worried about the influence they could lose with a fair, accountable voting system. Perhaps that’s why they are supporting the status quo with such gusto. Donors can give money to the official proponent and opponent as well as third party groups for the referendum — but only up to $1,200. But records show one family has given $13,200 to the No B.C. Proportionate Representation Society. How? Eleven family members each gave the maximum donation. Interestingly many of the same donors to the No side are also found in the BC Liberals’ database. Familiar names from real estate and tech dot the list. Of course, VotePRBC, the official proponent for Pro Rep, takes donations as well. But donors against Pro Rep seem to typically give the full $1,200 limit, while the Yes side is taking much smaller sums of money — from more people. The dollar signs are adding up on the No side, yet good campaigners (hey, Bernie) know during a campaign you’d rather have 50 donors giving one dollar, than one donor giving $50. After all, at the end of the day, we all only get one vote — no matter how much money you have. While that money can buy a lot of things — including scaremongering ads on television and on the internet — it cannot buy votes. That’s where you come in. We need to make sure everyone — those who are sick of the status quo, sick of politicians in safe seats, sick of wealth and power getting priority over regular people who live and work in this province — gets their ballot in. This is an uphill battle, it’s true. They have more money and power than we do. But just like when British Columbians banned Big Money in politics, we will work together. And we will win this battle too. thank you easy to see data Elections B.C. web site hard to find this info. Because I’m pushing towards my ’90’s I’ve been spending my life trying to be represented by FPTP. I was disappointed in 2005, bitterly disappointed in 2009, but now feel rejuvenated in this third attempt to be represented in the foreseeable future. And not only for me, because shortly I won’t be more than a memory, but I hope it’s a memory in the minds of my descendants that produced a broader democracy through Proportional Representation!